Nic Beveridge’s journey to the Netherlands to compete in the ITU World Triathlon Grand Final this week hasn’t come without complications. The Para-triathlete has overcome illness and misfortune on his way to facing off against the top nine athletes in his class in Rotterdam, but his overwhelmingly positive outlook didn’t allow him to throw in the towel. “I guess the good thing about being a triathlete, I guess even with life, is there’s always something you can do no matter what your situation,” Beveridge said. Beveridge’s situation left him without a racing wheelchair for three months. The trouble started in transit. The chair was a write-off and in the world of Para-sport, replacing specialised equipment isn’t as simple as a trip to the local shops. “It took three months to get the replacement but without the help of the airline it could have taken even longer. They were fantastic – they helped me rectify the situation as quickly as possible,” he said. Despite the limitations it would place on his performance, Beveridge borrowed a chair from another athlete and was ready to compete in the ITU World Series in Edmonton when misfortune struck again. Beveridge has a weakened immune system after contracting transverse myelitis in Year 12, which paralysed him from the waist down. Just prior to setting off for Edmonton, Beveridge was struck down by illness. “It was some sort of respiratory infection, I was completely fine then two days before I was due to fly out I woke up and I was gone. I was struggling to get out of bed and ended up having to go to hospital and get some tests done,” he said. Beveridge rode out the rough weather and is now fully healthy, with a new chair and ready to pick up where he left off. After the Paralympic Games in Rio last year, Beveridge joined forces with a new coach and has been closing the gap on his competition with surprising rapidity. “I reached out to a coach on the Gold Coast – his name is Dan Atkins. I’d met him a couple of times and spoken with him. Without really being able to put my finger on it I just had a good feeling about him,” he said. Beveridge felt he was capable of more and thought Atkins was the man to bring it out. His trust in Atkins has proven well-placed. Beveridge’s improvement can be marked by his performance in relation to close friend and five-time world champion Bill Chaffey. In Rio, Chaffey finished nine minutes ahead of Beveridge. That gap closed to just 47 seconds in Yokohama. “If you had said to me in 2016 after the Paralympic Games that in May 2017 that I’d be within 47 seconds of Bill I would have found that difficult to believe. I would have believed I could get closer to him but not close the gap that was currently there,” Beveridge said. 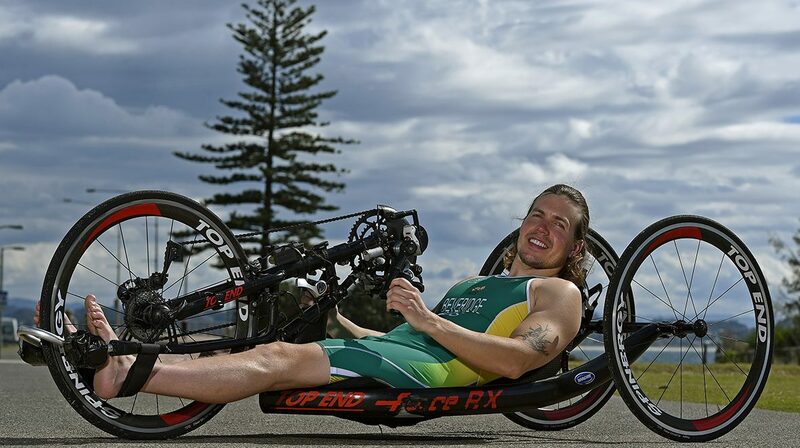 Chaffey has been an inspiration to Beveridge since stumbling across an article about the Para-triathlete and Ironman while lying in hospital, kick-starting his Para-sport career.